Tlalnepantla, Mexico.- At the inauguration of the XVI National Congress of Mediation, Mayor Denisse Ugalde Alegría reiterated the commitment that her 2016-2018 administration has to consolidate Tlalnepantla as a municipality with a culture of peace and in this way prevent violence and crime . Addressing the national and international speakers who gathered at the Centennial Theater, the mayor affirmed that it is essential that local governments make mediation and conciliation a public policy in order to confront the speeches of hatred, conflict, intolerance and aggressiveness that day by day gain ground on a global level. “It is in the municipalities where the real transformations that the country requires are achieved, which is why from the beginning of this administration we have worked to promote mediation as an alternative way of solving conflicts, aiming at achieving our objective,” she said. 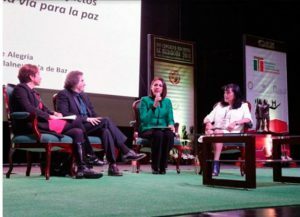 She thanked Jorge Pesqueira Leal, president of the Institute of Mediation of Mexico, for allowing Tlalnepantla to host this congress in which for four days specialists in the subject exchange experiences that contribute to a culture of peace. Denisse Ugalde recalled that this municipality arose originally from the conciliation of two cultures, and that continue to work daily work on this matter. Proof of this is that so far this year more than 1,300 people have been trained in courses to have the basic tools to be conciliators and to resolve conflicts peacefully in their communities. For his part, Jorge Pesqueira acknowledged the efforts that the local government has made to establish the Municipal Public Mediation and Conciliation Center and thus to promote restorative justice among citizens. He pointed out that this congress will be a space for the transmission of knowledge, reflection and, mainly, generation of ideas, which will contribute to boost the work that the municipal government carries out in this matter. Carlos Preza Millán, State Undersecretary of Government, said that for the State of Mexico it is an honor that Tlalnepantla is the seat of this XVI National Congress, since this locality was a pioneer in creating the Municipal Mediation Center, in which alternative dispute resolution methods are applied. He stressed that Governor Eruviel Avila Villegas has a great interest in this matter, always thinking about the welfare of Mexicans and strengthening the rule of law. Partipants in the inauguration included Sergio Javier Medina Peñaloza, president of the Judicial Power of the State of Mexico; Jorge Alberto Zorrilla, head of the Federal Board of Conciliation and Arbitration; as well as Jorge Armando Chávez Enríquez, head of Municipal Justice and executive coordinator of the Congress. The authorities awarded the Medal of Peace and Concord to Martha Camargo, a judge of the Judiciary. During the first day of work, Mayor Denisse Ugalde, Jorge Pesqueira and Lina Paola Rondón, adviser to the Presidential Adviser for Human Rights of Colombia, participated as speakers at the conference “Community mediation: Citizen Empowerment in Social Pacification and Prevention”.